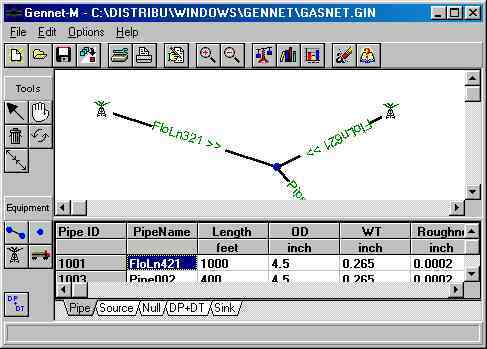 GENNET-M is a Windows program that calculates flow rates, pressures, temperatures, velocity and other related variables in a pipeline network system carrying petroleum gases, liquids, water and multiphase mixtures under Steady-State conditions. The name "GENNET" is an acronym for GENeral pipeline NETwork program. Thus, GENNET models systems comprised of pipes and Pressure/Temperature-changing equipment (pumps, compressors, heaters, valves, coolers, fittings, etc.) connected together in any configuration. For example, GENNET-M can handle gathering systems, flare systems, distribution systems, fire-loop systems, branched and looped pipelines. GENNET-M (the "M" stands for "Multiphase" mixtures of gas, oil or condensate and water) will handle multiphase fluid Mixtures, single-phase Liquids and single-phase Gases too. Liquid "Pigging" Factor Option (enables you to remove part or all of the liquids from any part or the system, so that you can calculate the improved, efficiencies of pigged lines).